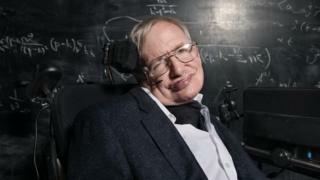 Plans for a public memorial to Prof Stephen Hawking in Cambridge are no further forward a year after his death, a councillor has said. The renowned physicist died aged 76 after a long battle with motor neurone disease on 14 March last year. Cambridge City Council unanimously passed a motion in April to create a permanent tribute to Prof Hawking. But councillor Rod Cantrill said he had seen "no evidence" of progress a year on "after making a public commitment". Council leader Lewis Herbert said a "few options" were still on the table. Ideas include the installation of a free public telescope, a black hole sculpture at the Guildhall or naming the proposed railway station at Addenbrooke's after him. Liberal Democrat councillor Mr Cantrill said naming one of the city's public parks after Prof Hawking would be a fitting tribute. He said: "At the time I made it clear that we need to do something to mark Prof Hawking's contribution, not just to the university and the city but to the world of science. "He made very complex science accessible to the person on the street." Prof Paul Shellard, director of the Stephen Hawking Centre for Theoretical Cosmology in Cambridge, said it was important to "establish in perpetuity his legacy" in the city. "It was a great privilege to observe his courage and determination and the good humour with which he faced the many challenges of his own life," he said. Mr Herbert said discussions were taking place between the council, Cambridge University and Gonville and Caius College over what form a permanent memorial would take. A memorial flagstone was installed in September in a private ceremony outside the late scientist's room in Caius Court. In June, the scientist's ashes were interred in Westminster Abbey following a public memorial service which celebrated his life.